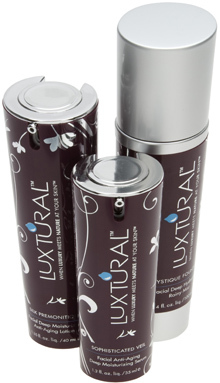 Buy all 3 of Luxtural’s unique products and receive the LUXTURAL® ULTIMATE EXPERIENCE. Start your ultimate experience with Mystique Fountain, a superb hydrator for any skin type. It tones, calms, cools and refreshes your skin, naturally protects it from environmental damage and reduces inflammation, preparing your skin for Luxtural’s moisturizer, “Silk Premonition”. Silk Premonition is extremely effective at giving your skin both the benefit of Luxtural’s long lasting deep hydration properties, and its highly advanced anti-aging benefits. Sophisticated Veil completes your LUXTURAL® ULTIMATE EXPERIENCE. As its name implies, our unique serum gently wraps your skin in a nourishing “veil” that is sheer, breathable and very protective. Sophisticated Veil helps prevent your skin from the loss of hydration, instantly giving it a “lifted” and brightened appearance, leaving your skin smoother and softer to the touch. *All LUXTURAL® formulas are patent pending. Facial Deep Moisturizing Anti-Aging Lotion. Facial Anti-Aging Deep Moisturizing Serum.